After Senator Grace Poe, it was Davao City Mayor Rodrigo Duterte’s turn to woo overseas Filipino workers (OFWs). 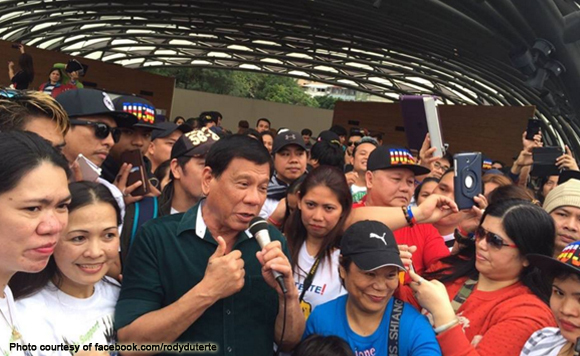 A post on Duterte’s official Facebook page showed the mayor in a photo speaking to OFWs at Taipei Expo Park about his plans for the country if elected president in May such as curbing crimes. Duterte was “mobbed by hundreds” of OFWs, it said. “He then took the Taiwan High Speed Rail going to the Hsinchu Taiwan Pavilion Expo and is actually considering putting up the same railway system in Davao City,” the post added. Duterte is in Taiwan upon the invitation of Taiwanese Representative to the Philippines Gary Song-Huann Lin. Poe, on the other hand, spent Christmas with her family in Hong Kong, where she chanced upon a gathering of migrants led by Migrante International. She was asked to take the stage and address those present. The senator assured Hong Kong OFWs that she remains a presidential candidate despite the recent ruling of the Commission on Elections that disqualified her from the race due to citizenship and residency issues.